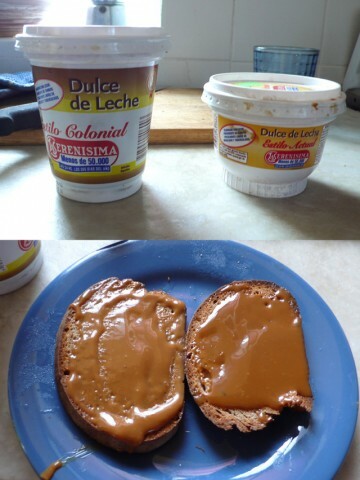 I enjoy dulce de leche on toast many mornings, and a few Sundays ago was to be one of those mornings, except we had run out. On Sundays few places are open and the stock at the local mercado was depleted. I found the brand La Sirenisima there, but not Estilo Colonial. Thus I was confronted with having to choose between two unknowns, “Estilo Actual” and “Repostería.” I chose Estilo Actual (Contemporary Style). It did the trick (zafa bien), but was different. I wasn’t sure why, and wanted to know better what it was about Estilo Colonial I preferred. This morning, with the container of Estilo Actual running out, I returned to the mecado and bought a new container of Estilo Colonial. I was ready for the taste test. Like back in the day comparing New Coke to Classic Coke, except without the blindfold. Here are the differences I perceived: In appearance, Estilo Colonial is a slightly darker color and a bit more viscous. Estilo Actual is a bit sweeter while Estilo Colonial has more of that deep caramel flavor, the flavor that to me makes dulce de leche so irresistable. I prefer Classic Coke and I prefer my dulce de leche Estilo Colonial. We survived just fine a month with Estilo Actual, but from now on I’ll be more careful to avoid running out of Estilo Colonial.